Not only has Navigon added a bunch of new features to its iPhone app, the price is $20 cheaper—although if you want Traffic Live and 3D maps, it still adds up to $100. Nonetheless, it sounds worth it. The update has a few nifty angles—there's the connection to your Facebook or Twitter accounts for updating friends on your current position, destination and time you're due to arrive; the aforementioned Panorama View 3D views (which use NASA height and terrain data) and personalized route delivery, called MyRoutes. The addition of NASA's data is a nice touch, meaning you'll be able to find out more about the location you're in, such as elevations and shadows. Discover a hill before you reach it—and maneuver around it if you're not keen on heights. MyRoutes, on the other hand, collects data on your preferences and habits, giving you customized routes along side the fastest/easiest ways to reach your destination. Here we come to the price. I mentioned before that it'll cost $100 if you want the full service for your iPhone or iPod Touch, with the actual price of the MobileNavigator app being lowered by $20 to $69.99. The Traffic Live has also been discounted slightly, from $24.99 to $19.99 (only available until the 15th of February), and the Panorama View 3D will cost $9.99. Those who bought the app before will get the update for free, according to Navigon. Yes, it's pricey. Yes, it's not far off what you'd spend on a stand-along satnav. 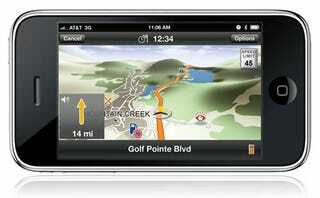 But as our iPhone navigation battlemodo deduced last August, the MobileNavigator is the best money can buy. And that was before all these new updates.